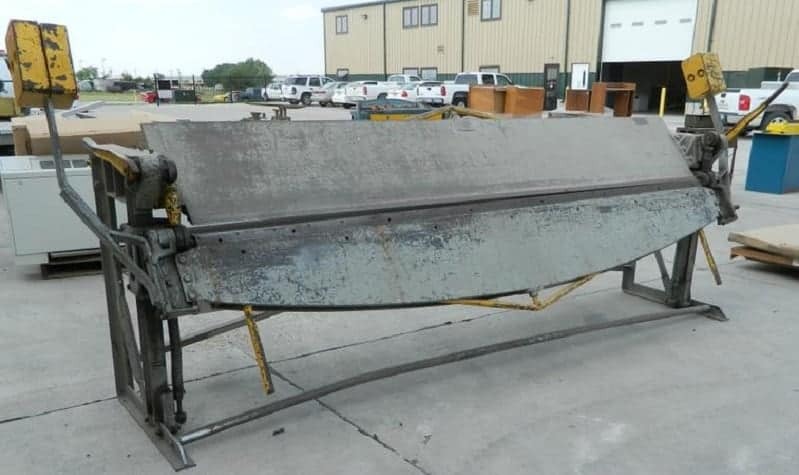 Looking for a new sheet metal brake? Or maybe buying one for the first time. If that’s the case you’re in the right place. We’ve brought together 5 different sheet metal brakes, covering a range of configurations to bring you a definitive review guide of the best currently available. For our findings at a glance, just head to the table below. For a detailed buyer’s guide, plus an in depth review of each of our choices, keep on reading. 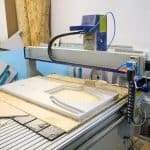 There are different brands and models of sheet metal brakes in the market but they can be graded depending on their design quality, construction quality, cost-performance, and quality of work. 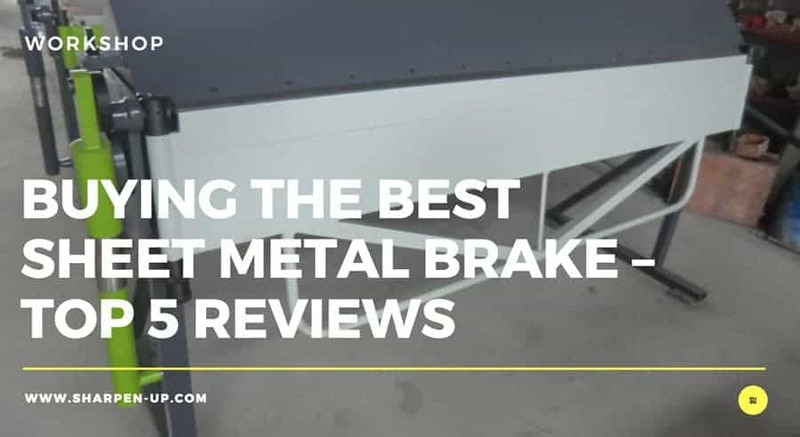 Based on these aforementioned grading criteria, here are our top 5 best sheet metal brake reviews. The Shop Fox M1011 takes our top spot for a good reason. This is a well-designed, high-performance pan-and-box brake whose clamping mechanism is manually operated. Its high-quality construction features ruggedly-built parts and a hinged gate-like front plate that is operated by a levered handle. This model has passed a rigid quality control test from Shop Fox, which is designed to ensure that the operation of the machine is reliable and also safe. Also, this durable machine is designed to offer superb trouble-free services including sheet metal bending and fabrication of gussets, brackets, fixtures, and boxes among other metal shaping services. As the name indicates, the machine model is made by Shop Fox which is in fact a subsidiary of the U.S-based Woodstock International, Inc. The dimensions are good too. The brake weighs in at about 99pounds and is 26inches long and 10.5inches wide. It also has two separate stands (or feet) whose combined footprint is 26.25inches long and 10.5inches wide. This gives it a steady base that allows for metal shaping without the machine wobbling. 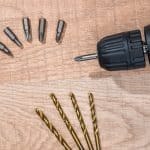 Likewise, each foot features drills holes which allow the body of this machine to be bolted onto a heavy-duty workbench. The maximum size of metal that can be bent or formed by this machine, accurately referred to as the material width capacity is 24 inches. Its clamping mechanism and the accompanying heavy-duty hold-down clamp lever allows this model to bend mild steel plates to any angle (described as the brake angle) within 0-135 degrees range. The maximum thickness of the metal plate, accurately described as the maximum material thickness capacity is 20 gauge for a mild steel plate. The clamping bar of this M1011 is made of 10 removable box fingers. This model is shipped with the following high-strength fingers, two 1-inch wide fingers, four 2-inch wide, two 3-inch wide, and two 4-inch wide fingers. Each fingers features a T-nut. These fingers are described as adjustable because the user can arrange them in any manner on the hold-down finger channel which allows the T-nut of the fingers to slide along its groove to any place within the channel. The fingers are then secured in their selected positions along the channel by a hold-down stop flange, which also allows for quick indexing of these fingers. Still, each finger can be moved closer to, or farther away from, another finger when the bend is forming, and this can be done using the finger position control. The box fingers have a knife-edge which allows the user to achieve a very sharp bend. These fingers are of different widths so that bends of varying widths to be made on the workpiece. The combined assembly of the hold-down finger channel and the box fingers installed on it is described as the hold-down clamp. This hold-down clamp is fitted on its frame, and the entire unit is called the hold-down assembly, and it serves to apply clamping pressure on the metal plate being bent or shaped. There is also a well-positioned and easy-to-use hold-down clamping lever that operates through a cam mechanism to either clamp or un-clamp the metal workpiece by lowering or raising the hold-down assembly respectively from the work-surface. This model comes with a hold-down height turnbuckle which is used to adjust the height of the hold-down clamp so that metal plates of varying thickness can be placed on the work-surface (called apron in this model). The apron face is flat and this allows for even pressure to be applied on the workpiece when it is being bent or formed. There is also an apron lever which allows the user to fine tune the process of metal bending by enabling one to achieve a very specific brake angle, for example 120.5 degrees. The maximum work depth of this model is determined by the width of the high-strength fingers (also called box dies), and the maximum box depth is 1.75inches. The Shop Fox M1011 benefits from a 24-month warranty guaranteed by Woodstock International, Inc. High-performance sheet metal brake that can bend metal plate as well create complex metal fabrications. Comes with two 1-inch wide fingers, four 2-inch wide, two 3-inch wide, and two 4-inch wide fingers. Entire pan-and-box brake can be mounted on a heavy-duty workbench. Material width capacity of 24inches. Brake angle range is 0-135 degrees. Maximum box depth of 1.75inches. Maximum material thickness capacity for a mild steel plate is gauge 20. The Shop Fox M1011 is a well-designed, high-performance pan-and-box brake that features a high-quality construction. With ruggedly-built parts, high-quality hold-down assembly and mountable body this is a uunit that will last you a long time. The unit holds a maximum of 10 high-strength box fingers and its material width capacity is 24inches; while the maximum box depth 1.75inches; this all amounts to top notch versatility. Its brake angle range is 0-135 degrees, while its maximum material thickness capacity for a mild steel plate is gauge 20. 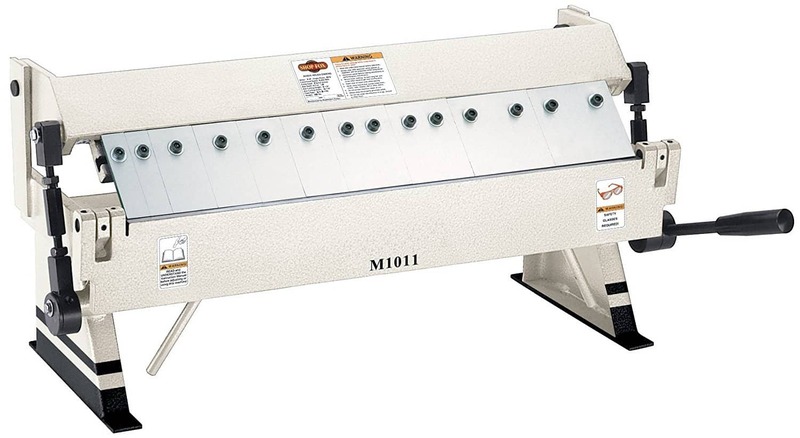 This excellent design quality and high cost-performance ratio, make the Shop Fox M1011 the top pick in our best sheet metal brake review round up. The Malco MB48A is a compactly-designed, high-performance portable cornice mini-brake whose clamping mechanism is manually operated, and can be optionally used with a leg kit that needs to be acquired separately. Its robust construction features a cam-over style of clamping mechanism. It offers safe and reliable operation as a result. Likewise, this durable metal-working tool can offer superb trouble-free services including sheet metal bending and workpiece fabrication, especially plenum fabrication. This model has no fixed depth hence very large bends can be achieved using it. This machine model is made by the U.S-based company, Malco Products, SBC. The compactly-designed sheet metal mini-brake weighs about 58pounds, which makes it significantly lighter than Shop Fox M1011; hence the increased portability factor. The user can easily transport or move it around the workplace so to create fabrications, including compact fabrications. It is 52inches long and 12inches wide; while its overall height is 10inches. Also, it can be fitted on a leg kit so as to give it a steady base that allows for metal shaping without the machine wobbling. The color scheme of this mini-brake model is black. 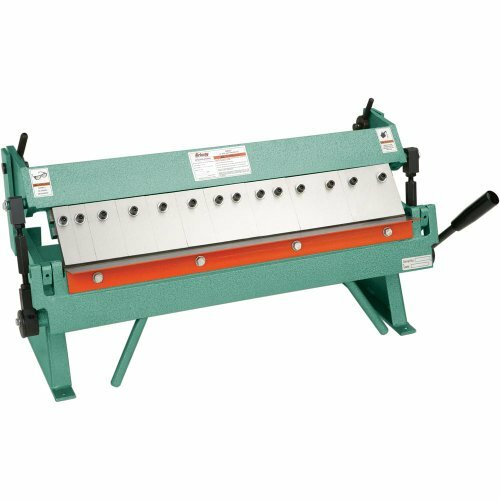 This mini-brake model is well-suited for bending roofing components along with fabricating narrow roof-flashing strips and plenums. It can also create compact fabrications, including 4-inch square fabrications. Because it is portable, it can be fitted on the tailgate of a truck and be used for metal-working. Likewise, because it lacks a depth limit, it can bend or fabricate any length of sheet metal so long as its width does not exceed 48inches. The maximum material width capacity of this mini-brake model is 48inches (4feet). 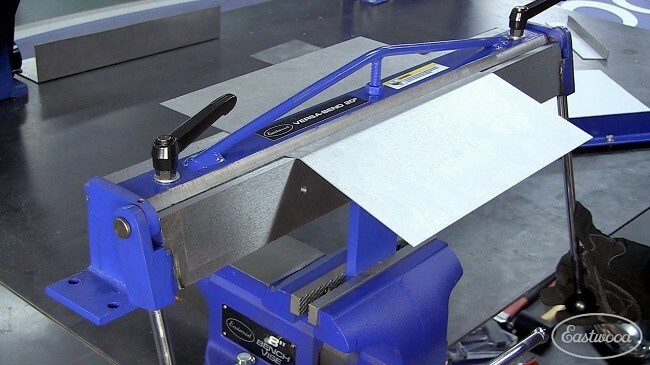 Its clamping mechanism and the accompanying heavy-duty hold-down clamp lever allows this model to bend aluminum, copper, and galvanized sheet metal plates. Its brake angle range is 0-135 degrees. 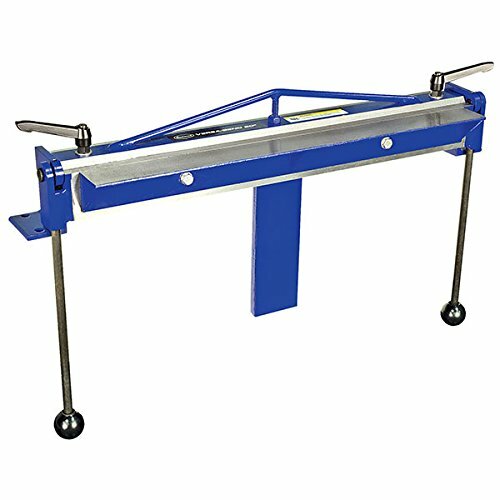 The clamping bar comes with adjustable strengthening ribs which enhance its performance when forming compact fabrications. These ribs do this by adjusting the configuration of the anvil and apron on the body frame. The maximum material thickness capacity of the Malco MB48A is 22 gauge for galvanized sheet metal. Its apron face is flat and this allows for even pressure to be applied on the workpiece when it is being bent or formed. There is also an apron lever which allows the user to fine tune the process of metal bending by enabling one to achieve very fine brake angles. High-performance sheet metal mini-brake that can create compact fabrications. High-quality 50-inch long clamping bar assembly. Maximum material width capacity of 48inches. Maximum material thickness capacity for a galvanized sheet metal is 20 gauge. Comes without a leg kit. Need to separately purchase leg kit makes it relatively expensive. The Malco MB48A is a compactly-designed, high-performance portable mini-brake whose cam-over style of clamping mechanism is manually operated, and can be optionally used with a leg kit that needs to be acquired separately. Its maximum material width capacity is 48inches and its depth is unlimited; while its brake angle range is 0-135 degrees for a galvanized sheet metal of gauge 20. It’s lightweight construction coming in at around 58 pounds, make this an ideal brake for those looking for portability. Highly recommended. The Eastwood 14042 is a compactly-designed, high-performance portable folder brake whose clamping mechanism is manually operated. The unit features an offset metal-brake assembly, vice mount tab, and 2 actuating rods along with 2 bench-mount brackets. 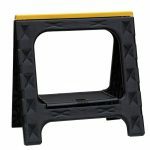 The bench-mount brackets have drilled holes which allow the user to mount this model on a heavy-duty work-bench. It offers safe and reliable operation. Also, this durable metal-working tool can offer extended trouble-free services including sheet metal bending and workpiece fabrication. 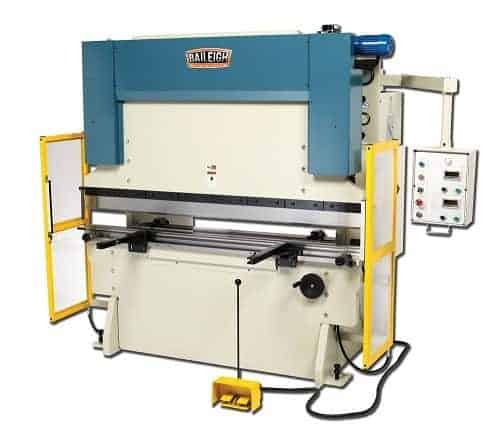 This machine is designed to produce both standard and variable length bend on 20-inch wide metal plates. Likewise, it is well-designed to produce highly accurate 0.5-inch offset bend. The model is made by the China-based company, The Eastwood Company. This compactly-designed sheet metal brake weighs about 38.4pounds, which makes it significantly lighter than both the Shop Fox M1011 and the Malco MB48A. It also makes this unit very portable and the user can easily transport or move it around the workplace so to fabricate metal plates. In fact, it is well-suited to be fitted on a vice. It can also be mounted on standard work-bench. It is 26.2inches long and 9.3inches wide; while its overall thickness is 4.7inches. The color scheme of this mini-brake model is blue and silver. This brake model is well-suited for bending 20-inch wide 20-gauge steel plates, while its ability to create precision-engineered offset bends makes it suitable for fabricating floor reinforcements, corrugated truck-bed floors, inner fender structures, truck-bedside panels, and channels along with ribs. Also, because it is portable, it can be clamped by vices fitted on the tailgate of a truck. The maximum material width capacity of this brake model is 20inches. 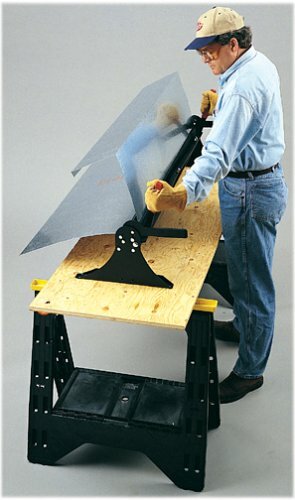 Its clamping mechanism and the accompanying heavy-duty hold-down clamp lever allows this model to bend aluminum, copper, and galvanized sheet metal plates. Its brake angle range is 0-90 degrees. The maximum material thickness capacity of this brake is 20 gauge for steel sheets, and 18 gauge for aluminum plates. High-performance sheet metal mini-brake that can create highly accurate 0.5-inch offset bends. Maximum material width capacity of 20inches. Brake angle range is 0-90 degrees. Maximum material thickness capacity for a steel sheet is 20 gauge. Not a free-standing model and needs to be mounted on a workbench or vice. The Eastwood 14042 is a compactly-designed, high-performance manually-operated brake whose high-quality construction features ruggedly-built parts, an offset metal-brake assembly, vice mount tab, and 2 actuating rods along with 2 bench-mount brackets. Its maximum material width capacity is 20inches, and its brake angle range is 0-90 degrees for a steel plate whose gauge is 20. 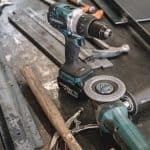 While a bit smaller than some of the other brakes reviewed in this top 5, this is still a good machine for both contractors and home workshopers alike. The Grizzly G0557 is a heavy-duty, well-designed, and high-performance pan-and-box brake whose clamping mechanism is manually operated. Its high-quality construction features ruggedly-built parts including a cam mechanism that operates the hinged apron through a levered handle. This machine is reliable and safe for use. 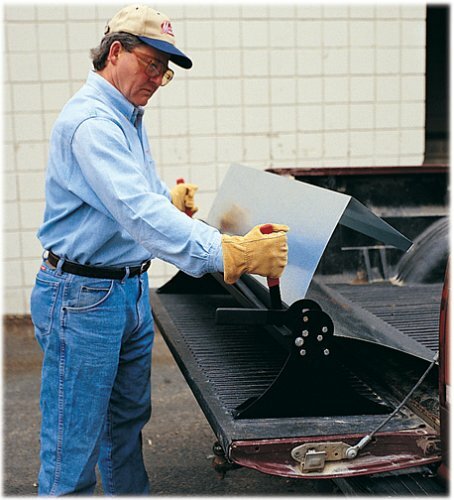 Likewise, it is durable ad offers trouble-free sheet metal bending and fabrication services. This brake model is made by Grizzly Industrial, Inc. This compactly-designed sheet metal brake weighs about 131pounds, which makes it considerably heavier than its closest congener in this review, the Shop Fox M1011. It also makes it less portable than the Eastwood and the Malco. It is 33inches long and 19.8inches wide, while the overall height of the hold-down assembly is 14.5inches. The Grizzly has two separate stands (feet) which give it a steady base that allows for metal shaping without the machine wobbling. 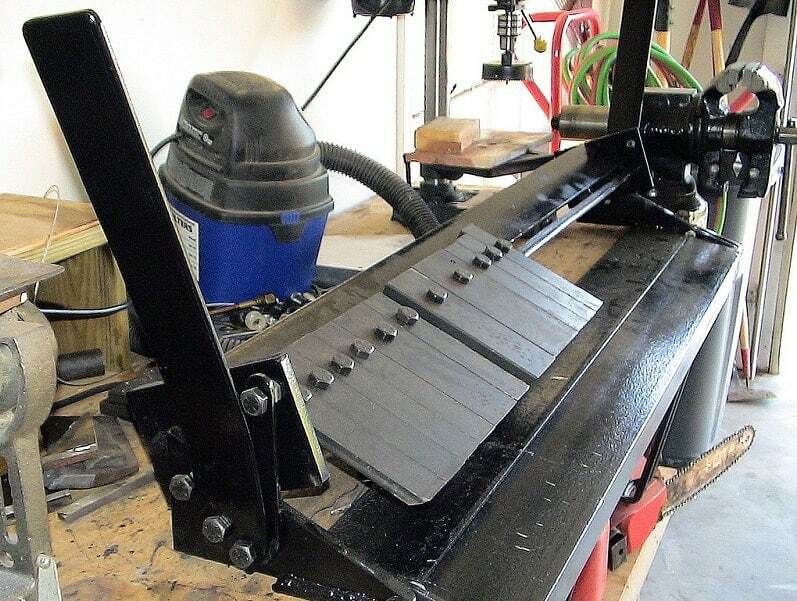 Also, each foot features drills holes which allow the body of this machine to be bolted onto a heavy-duty workbench. The color scheme of this brake model is light green and silver. The maximum material width capacity of the Grizzly G0557 is 24 inches. 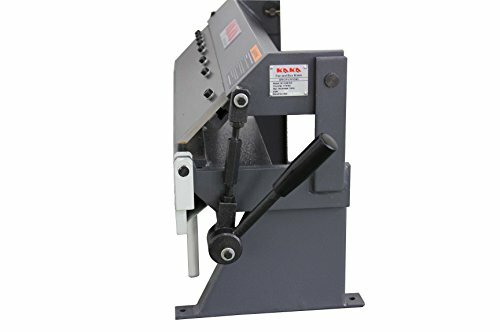 Its clamping mechanism and the accompanying heavy-duty hold-down clamp lever allows this model to bend mild steel plates with its brake angle range being 0-135 degrees range. Its maximum material thickness capacity is 20 gauge for a mild steel plate. The hold-down assembly of the G0557 has the same construction design as that found on the Shop Fox M1011. The clamping bar of this brake is made of 10 removable box fingers. These high-strength fingers are shipped with the machine, and they are two 1-inch wide fingers, four 2-inch wide, two 3-inch wide, and two 4-inch wide fingers. Each fingers has a T-nut which secure them on the hold-down finger channel. These fingers are adjustable and the user can arrange them in any manner on the hold-down finger channel. The fingers are then secured in their selected positions along the channel by a hold-down stop flange, which also allows for quick indexing of these fingers. Relatedly, the box fingers have a knife-edge which allows the user to achieve a very sharp bend. These fingers are of different widths so that bends of varying widths to be made on the workpiece. The hold-down assembly of the Grizzly G0557 serves to apply clamping pressure on the metal plate being bent or shaped. Its operation is managed through a well-positioned and easy-to-use hold-down clamping lever that works through a cam mechanism to either clamp or un-clamp the metal workpiece by lowering or raising the hold-down assembly respectively from the work-surface. The Grizzly G0557 has a hold-down height turnbuckle that allows for the height adjustment of the hold-down clamp so that metal plates of varying thickness can be placed on the apron. The apron face is flat and this allows for even pressure to be applied on the workpiece. There is also an apron lever. The Grizzly G0557 is a well-designed pan-and-box brake that features a high-quality construction with a hold-down assembly and mountable body whose hinged apron is operated manually by a cam-levered handle. It holds a maximum of 10 high-strength box fingers and its material width capacity is 24inches. Its brake angle range is 0-135 degrees, and its maximum material thickness capacity for a mild steel plate is gauge 20. If portability isn’t a huge factor for you, this comes in as a suitable second choice to our top pick Shop Fox. 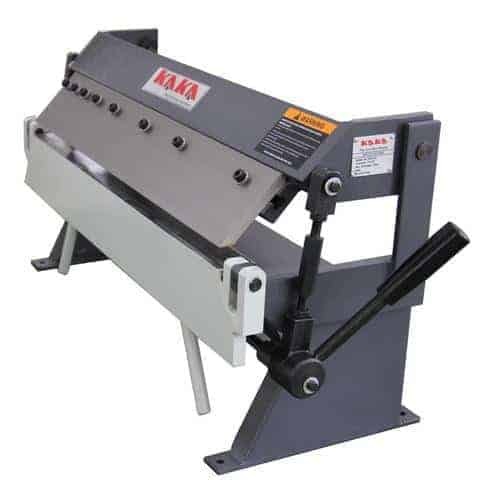 The Kaka Industrial metal brake is a high-precision pan-and-box brake. This too features a hold-down assembly and mountable body with a hinged apron that is operated manually by a cam-levered handle. This brake model is made by Kaka Industrial LLC. This compactly-designed sheet metal brake weighs about 101.2pounds, which makes it heavier than the Shop Fox M1011, but lighter than the Grizzly G0557. This puts it the realm of the less portable brakes. It is 31.9inches long and 16.5inches wide, while the overall height of the hold-down assembly is 13.4inches. It has two separate stands (feet) that give it a steady base that allows for metal shaping without wobbling. Also, each foot features drills holes which allow the body of this machine to be bolted onto a heavy-duty workbench. The color scheme of this brake model is gray. The maximum material width capacity of the Kaka Industrial W1.0x610a is 24 inches. Its clamping mechanism and the accompanying heavy-duty hold-down clamp lever allows this model to bend mild steel plates with its brake angle range being 0-135 degrees range. Likewise, its maximum material thickness capacity is 20 gauge for a mild steel plate. The hold-down assembly of the Kaka Industrial W1.0x610a has the same construction design as that found on both the G0557 and the M1011. Still, the clamping bar of the Kaka is made of unique removable box fingers of the following widths 1inch,2inches,3inches,8inches, and10inches. These high-strength fingers are shipped with the machine. Each fingers has a T-nut which secure them on the hold-down finger channel. These fingers are adjustable and the user can arrange them in any manner on the hold-down finger channel. The fingers are thereafter secured in their selected positions along the channel by a hold-down stop flange, which also allows for quick indexing of these fingers. Still, each finger can be moved closer to, or farther away from, another finger when the bend is forming, and this is done using the finger position control. The hold-down assembly of Kaka Industrial W1.0x610a serves to apply clamping pressure on the metal plate being bent or shaped. Its operation is managed through a well-positioned and easy-to-use hold-down clamping lever that works through a cam mechanism to either clamp or unclamp the workpiece by respectively lowering or raising the hold-down assembly. Liker both the Grizzly G0557 and the Shop Fox M1011, the W1.0x610a also has a hold-down height turnbuckle that allows for the height adjustment of the hold-down clamp so that metal plates of varying thickness can be placed on the apron. The apron face is flat and this allows for even pressure to be applied on the workpiece. There is also an apron lever. This model benefits from a warranty that lasts 12 months. 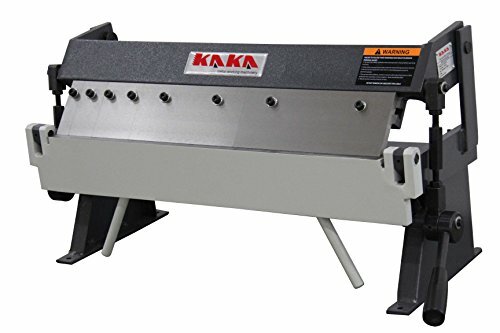 The Kaka Industrial W1.0x610a is a high-precision pan-and-box brake that features a hold-down assembly and mountable body. It also has a hinged apron that is operated manually by a cam-levered handle. 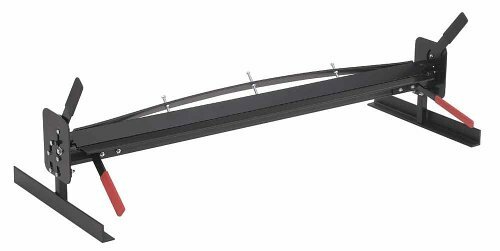 Its material width capacity is 24inches, while its brake angle range is 0-135 degrees, and its maximum material thickness capacity for a mild steel plate is gauge 20. Highly recommended. What is a sheet metal brake? The sheet metal brake is a specialized metalworking machine purposely designed to support bending and shaping of sheet metals. The bending process allows for the workpiece to be shaped along a (lengthwise or width-wise) straight axis into a U-shape, V-shape, or channel shape product; or for a hem to be formed. 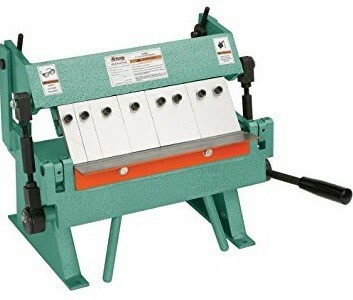 It is also called a bending brake, or simply, bending machine. How does a sheet metal break work? The operational design of the sheet metal brake consists of 3 basic parts. The first one is the flat surface (also called work-surface) where the work piece is placed. The secondly one is the clamping bar that is brought down onto the workpiece upon which it firmly holds it in place as it is being bent. The clamping action that allows for the operation of this clamping bar can be distinguished into 3 different modes of operation; manual operation, automatic operation, and operation through a foot pedal. The third part is the hinged gate-like plate that is located on the front of the machine. The hinged gate-like plate is the one which is used to bend the metal sheet; and when not in use, it rests against the machine below the work-surface, which allows the workpiece to be fed to the work-surface and then it (gate-like plate) is raised against the protruding section of the workpiece which it forces to bend against the front edge of the clamping bar. The angle of the bend can reach 120 degrees, or more if a bar folder brake is used. Likewise, if the area for bending is narrow, an obtuse bend can be made initially, and then this bend can be pressed down by the clamp into a hem. There are 4 basic types of sheet metal brakes; the cornice, box-and-pan, bar folder, and press brakes. The cornice brake features a full-width clamping bar, that is, the bar length covers the entire width of the bending brake; and this allows it to make straight bends along an entire side of the workpiece. 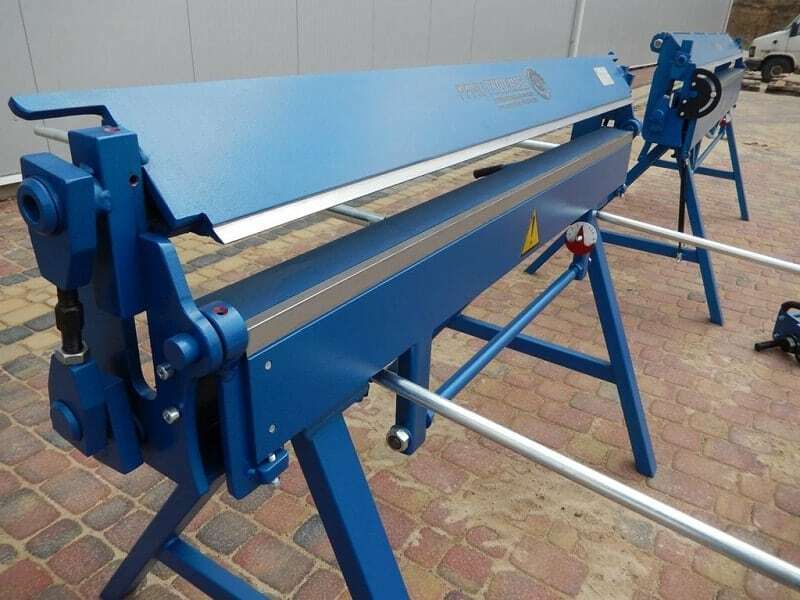 The box-and-pan brake features a clamping bar made of removable blocks which allows for the adjusting of the bar size (by removing, re-arranging, or adding blocks) so that bending can be restricted to specific areas or partially-formed areas of the workpiece. This allows a box or pan to be impressed onto the workpiece, with the formed workpiece being completed by any metal fixing process including riveting, screwing, soldering, or welding. 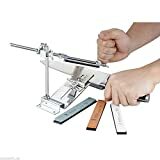 The bar folder brake has simple design and uses its single handle to simultaneously clamp the workpiece while forming the bend, all in one motion. It is also smaller than either box-and-pan or cornice brakes, and its depth is also considerably less. This depth describes how much the workpiece can be fed into the bending machine, which also automatically determines the size of the (protruding) segment to be bent. Usually, there is a adjustable back gauge that can be moved back or forward so as to adjust the depth of the bending brake. The press brake has the most complex design and operation of the 4 types of bending machines, and it can form complex pre-determined bends on the workpiece after clamping it between a punch (which is analogous to the hinged gate-like plate) and a die (which is analogous to the clamping bar). The shape of the punch and die must match for the metal sheet to be formed properly. There are different sizes of bending brakes, with the size and operational design determining how much work any particular brake can handle. Apart from size, there are other key factors that one needs to take into account when acquiring a bending brake. One of these factors is the bending force, also referred to as the tonnage. 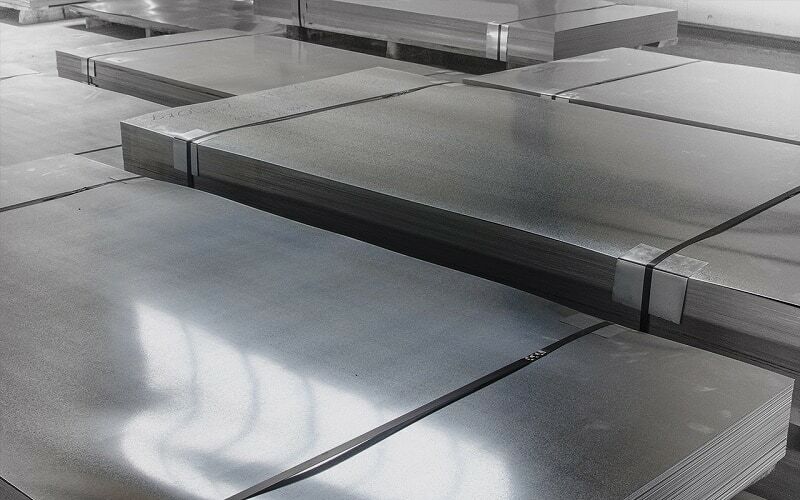 The tonnage required is determined by the length, thickness, and material of the metal sheet – with aluminum and brass plates of equal size requiring less tonnage as compared to a steel plate of equivalent size. There is a formula used to calculate the desired tonnage, and most manufacturers also provide a tonnage chart for quick determination of the right tonnage. The second factor for consideration is the working length of the brake as it determines the maximum length of bend that can be achieved. This working length is basically the maximum capacity of the bending brake, and it is usually the full length of the clamping bar. The third factor is the mechanism of the clamping action. 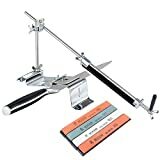 Much like the traditional shop press (or even many of the new rosin presses entering the market), the clamping action will be carried out via hydraulic or pneumatic force. 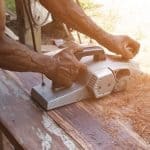 Some older, smaller tools may be operated manually using handles or foot pedals. The last basic factor is the quality and operational pliability of the backgauge. Operational pliability describes how easy it is for one to smoothly and quickly adjust the backgauge. In high-quality press brakes, backgauge adjustments are done through the CNC (computer numerical control). It is also better to purchase a bending brake that is supported by a warranty, than to go for one of equivalent quality but lacks any guarantee.